The State of Kansas is heading towards a cliff despite reports of budget surplus and campaign rhetoric. State budget analysts show Kansas deficit spending next year, and empty reserves by 2022. This is due to current levels of spending outpacing tax revenues. Something will have to give as the legislature and incoming governor decide how to fix the budget imbalance. Raise taxes? Limit spending? Use the budget gimmicks bemoaned by many? 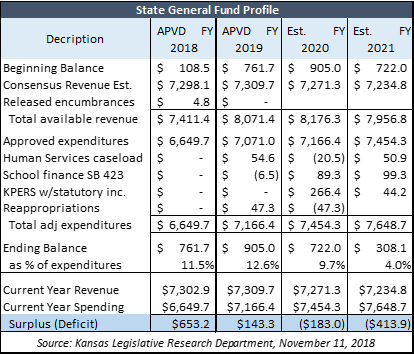 After the consensus revenue estimating group outlined rosy expectations for tax collections in fiscal year 2019, they produced the State General Fund Profile (click to enlarge). It acts as a multi-year checkbook for the state’s general budget. Like any checkbook, if you are spending more than what you are bringing in, then your check balance falls and turns negative. The same goes for state government. Kansas is spending more than it brings in via taxes beginning with fiscal year 2020 – state fiscal years start on July 1 – when the ending balance drops from $905 million to $722 million. Simply put, the incoming administration will not be able to balance the budget without raising taxes or cutting back spending…unless they use the budget gimmicks discussed below. 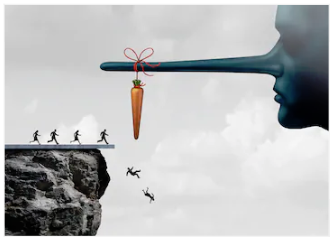 There will be no available tax revenue to “properly fund” schools and “cut the sales tax on food.” There will be no available tax revenue to grow state agency budgets. Most importantly, there will be no available tax revenue for Medicaid Expansion. The largest tax increase in state history, supported by then-Senator Kelly, is still not enough to offset enormous spending increases. It isn’t encouraging to see what is supposed to be a 7.5% ending balance start small and, if spending and revenue patterns continue, disappear. This information brings us full circle to the revelation that Kansans will see around a $3.7 billion tax increase – based on previous spending estimates – sometime within the next four years. Avoiding this structural gap with a 7.5% reserve, the incoming administration may employ similar fiscal maneuvers such as highway fund sweeps, and KPERS funding delays to name a few. Such tactics were not only used under the prior administration, but also under the Sebelius/Parkinson administration 10 years ago. If not these gimmicks or cutting spending, Kansans will be pushed off the fiscal edge with another massive tax hike.